The brilliant anatomist Dr. Thomas Silkstone returns in Tessa Harris's vivid and compelling mystery series set in 1780s London. . . It is not just the living who are prey to London's criminals and cutpurses. Corpses, too, are fair game--dug up from fresh graves and sold to unscrupulous men of science. Dr. Thomas Silkstone abhors such methods, but his leading rival, Dr. John Hunter, has learned of the imminent death of eight-foot-tall Charles Byrne, known as the "Irish Giant," and will go to any lengths to obtain the body for his research. 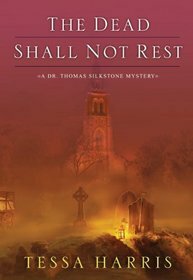 Book two of the Dr. Thomas Silkstone series, The Dead Shall Not Rest delves into the dark depths of forensics and human nature. In this novel we travel with Thomas as he meets a giant with an illness, who wants a posthumous pardon for his father and to be saved from the knife when his time comes. The society surrounding them try to prevent these actions as many other anatomists, such as Dr. Hunter, become overly fascinated with the prospect of examining Charles Byrne, the Irish Giant. I found the main and subplots intriguing and suspenseful, and nothing ended up the way I thought it would. I love books that switch things up like that. The mixture of fiction and nonfiction within the novel provided a storyline that was even more heartfelt because you realize that this person actually existed and had these struggles. I loved meeting and going through Charles Byrne’s story within the last few months of his life, and the scandal that arose from it, I only wished he didn’t have to go through it all. It was interesting how Byrne’s story was told, including Dr. Silkstone but not really involving him as much, as to keep the credibility of the original story while instilling the fictional complicities of the series. The author makes us readers fall in love with Charles Byrne’s character, eliciting the love and pity he so well deserved. Also indirectly included were a few other mysteries; the murder of the young castrato, Cappelli, and the mysterious depression of Lady Lydia. The proceedings of the castrato’s murder grew in interest as I read on and realized the complexity of the case, as with Lady Lydia’s sudden depression (initially I thought she was being overly dramatic, and a weak character all around, but recanted when I learned the full truth.) In this novel, nothing is as it seems. With all evidence pointing towards the nefarious Dr. John Hunter and his unscrupulous dealings, this book had me drawn through every chapter, wanting to follow Thomas’ suspicions and findings. The writing style generates credible characters and a gritty victorian age descriptive background. This enables the reader to submerge into the created society and take in the novel’s adventurous and emotional journey. I’ve both read this book and listened to the wonderful audiobook. Both complement each other greatly, and Simon Vance (the narrator) is truly a vocal artist! This is a greatly thought out and researched historical mystery, and I would absolutely recommend it to those who love the great mysteries of London’s past.